June | 2015 | Poverty, Agony, Distress & Want! Well, it’s pretty much the story of life isn’t it? I think all of us have experienced this at various points during our lives. The ups and downs are all part of the journey and make it all that much more interesting. It can take on many different forms, whether it be about our relationships, careers, school or sports, it doesn’t matter. In this case, I’m referring to something a little different, but when aren’t I? Now that I’ve peaked your interest (or maybe not), I can blather on about a bunch of other stuff first. So, here we are at the end of June. Despite my best intentions to write more often, it’s unfortunately been over a month since my last post…I guess there are too many other things to preoccupy my time. That means I have a lot to catch up on. The end of June means that we are days away from the end of the school year. In my case, it’s technically down to one day; in reality I’m on the clock until Saturday, but that’s a story for later. As I’ve stated repeatedly in the past, this year has been a complete blur. The years seem to go by faster and faster. I can’t believe I’m almost done my 17th year of teaching at St. Patrick…geez I’m getting old! With my upcoming semester off, I only have 12.5 years left of teaching. Never mind the year, my life is turning into a blur! On Thursday I’m forsaking the last couple days of school to travel with the football program to the University of Minnesota-Duluth team camp. We have 25 players heading down with us and as usual it should prove to be a fantastic experience. UMD Head Coach Curt Weise and his staff put on an amazing event for players and coaches alike. The weather is even supposed to cooperate for us while we are there! With all this talk about the end of school and football trips, we must be heading into summer. Thank Jesus! Yes, I know, poor teacher; life must be rough with all the holidays we get. The fact of the matter is I’m tired and burnt out. It’s not easy teaching teenagers…or any kids for that matter. I know what it’s like being at home all day with my boys and I can’t imagine having them plus another 20 or more for 5 days a week. I’d need to take up drinking! In any case, the time to decompress will be nice and I’ll be able to spend some time with the family (and some me time too). My railway time lately has been taking a beating with all the other stuff going on, but I hope to change that soon. With the end of the school year, I’ve already planned my first research session of the summer for next week. 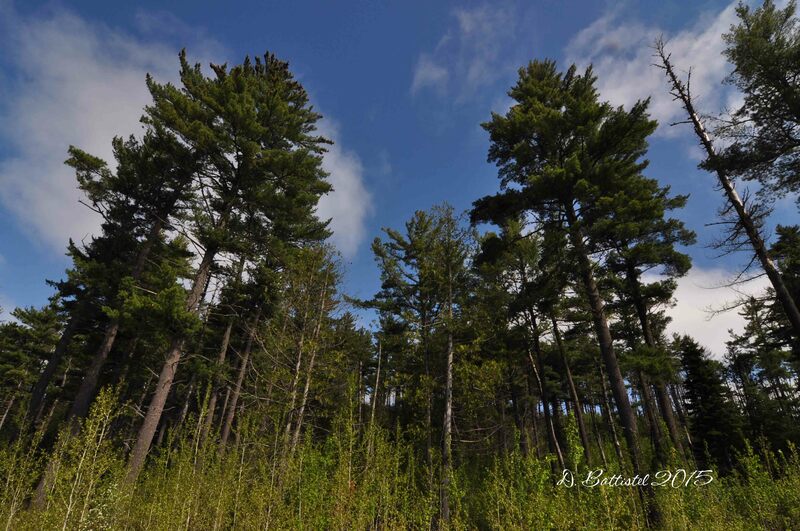 Last year I spent a whole day at the Cook County Museum in Grand Marais looking through the Arpin Papers, which are the records of Daniel J. Arpin, president of the Pigeon River Lumber Company. I managed to examine four of the books, which at 500 pages per book made for an interesting day. There are still a number of volumes to look at, so I imagine it will take multiple trips to finish it all. I’m sure I’ll be bug-eyed by the end, but I know there will be a lot of great information to come from it. The beginning of summer of vacation means that I’ll have more time to spend doing field work which will make me immensely happy. At the end of my upcoming trip to Duluth I have a meeting scheduled with all the principals involved in the July exploration of Camp 4. Hopefully we can formulate a good plan to maximize our time in the area. In the meantime, I have a few other hikes on the books along the PAD&W and G&LS to tide me over. My last trek into the outdoors occurred at the end of May and is reflected in the title of this blog. I was very excited to visit a an unexplored portion of the Gunflint & Lake Superior Railroad, but unfortunately it did not pan out as I expected. 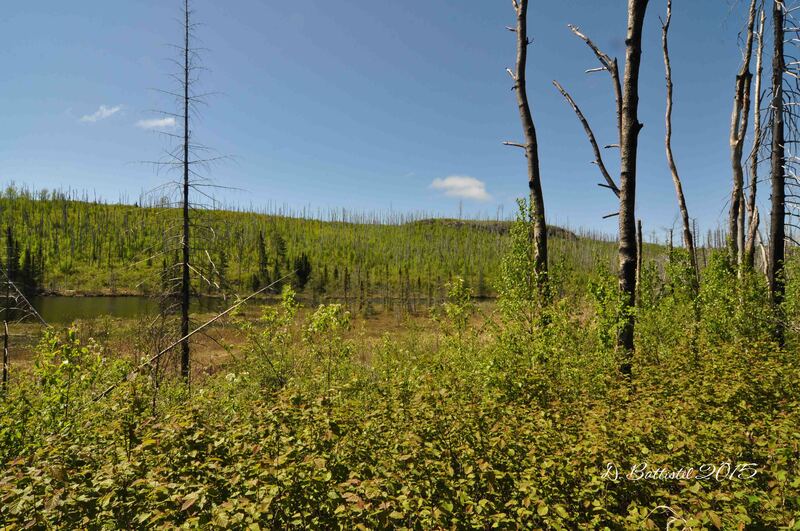 One of the biggest mysteries surrounding this little logging railroad is how far it extended into the Minnesota wilderness. 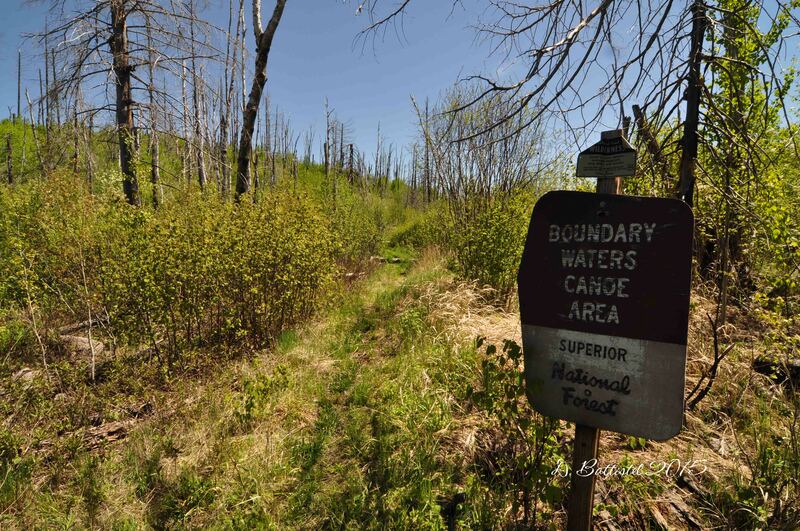 It’s route from the PAD&W across the border and 4.5 kilometres to the ridge on the south shore of Gunflint Lake is very well documented. The next kilometre from the ridge to Crab Lake is a little more sketchy but generally known; it is here where the questions begin. According to statistics, the G&LS reached its maximum length in 1907-1908 at nearly 5.5 miles (far short of its planned 30 miles). That means there could have been another 4 kilometres of track beyond where it reached Crab Lake. Where the track was located and how far it extended toward Whisker Lake is unknown. 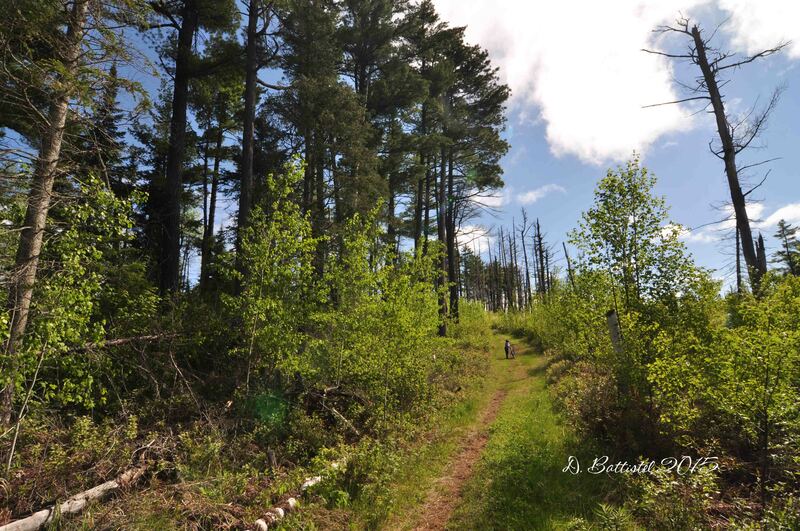 So my plan was to drive up the Gunflint Trail as far as Loon Lake and then go north to the Crab Lake Trailhead of the Border Route Trail. This access trail extends some 3 km from Loon Lake to Crab Lake and then another 1.5 km to where it meets the Border Route Trail. 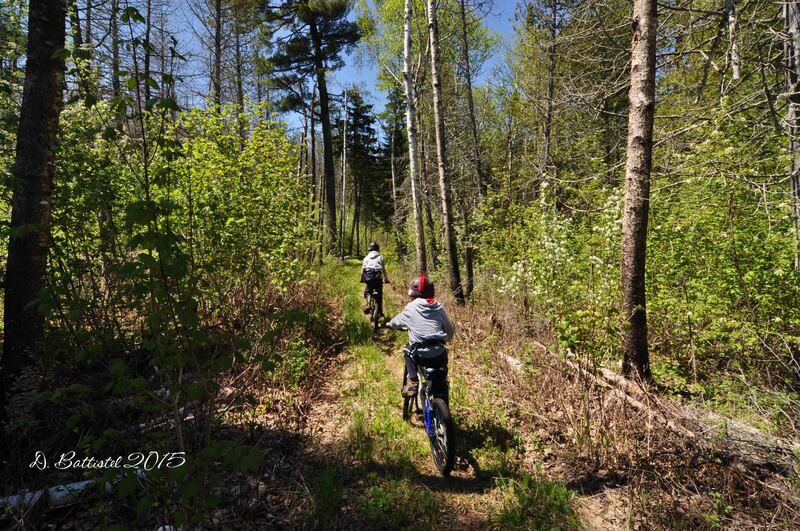 I would walk and the boys would ride their bikes to where the trail passes between Crab and Whisker Lakes and at that point try and locate any traces of a railroad grade. I hoped my new metal detector would locate any spikes that had been left behind when the rails were removed. It took us about an hour to reach our destination; along the way I periodically swept the trail with the detector to see if there were any traces of a rail line along the south shore of Crab (I’m pretty convinced that this trail was indeed built in 1936 during a forest fire). At the east end of Crab and on toward Whisker, I swept around with the detector but nothing really turned up. Sometimes you can hype things up too much and end up disappointing yourself. I guess I just assumed I’d get there, find a whole bunch of spikes and see a clearly defined right of way. Most likely if the railroad did extend this far it was a temporary affair and there was not a lot of effort put into the construction of the grade. It’s not that I am giving up, but I’ll have to reload and rethink my strategy. Maybe continuing to follow the grade east from where it meets Crab might help me connect the dots. In any case, it was a nice hike and I got to spend some time with the boys. You win some, you lose some! 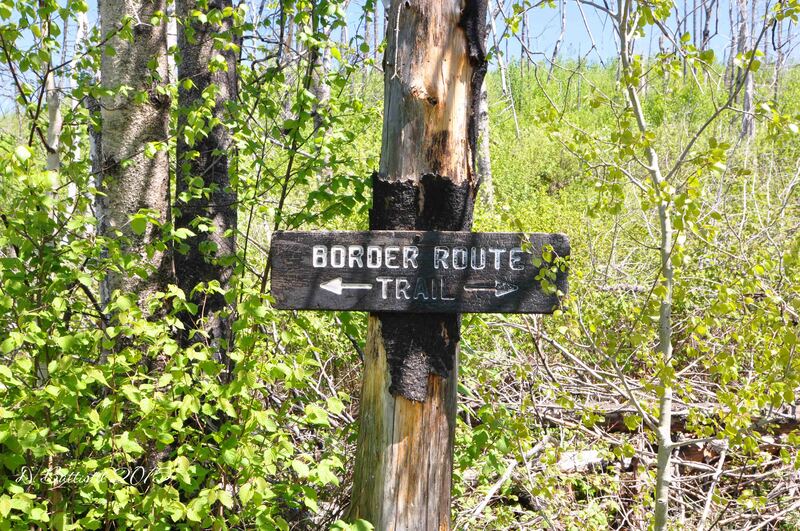 Border Route Trail, May 2015.